Best hotel in Patna with deluxe rooms and suite rooms and ample parking space. Amit Hotel Patna is the best budget hotel for tourists and is near Patna Railway Station / Junction and Patna Airport and Buddha Smriti Park. If you are looking for 3 star or 5 star hotel in Patna Bihar, then Amit Hotel in Anisabad Patna is the best place to stay and best luxury hotel in Patna. Amit Hotel welcomes you to Patna, the capital city of Bihar, a land rich in culture, history and authentic Indian Hospitality. The Hotel is ideal for business travelers and tourists interested in historic, cultural and religious matters. Nalanda, Rajgir, Bodhgaya and Vaishali are the places known as the land of Lord Buddha along wth Buddha Smriti Park in Patna. Harmandir at Patna Sahib, the birthplace of Guru Govind Singhji, Kakolat. Located at the strategic point 3 kms from the Patna Airport and 4 kms from Patna Railway Station having with fully air conditioned, well equipped modern furnished luxurious rooms with grand and glamorous suites offers a unique personalized service to the guests. The hotel boasts with a Multi Cuisine Restaurant serving lavish mouth watering dishes with Room Service facilities in Patna. The hotel has elaborate conferencing and banqueting facilities with most modern devices. Amit Hotel Patna provides unmatched hospitality experience to its guests who are coming for business or leisure or tourism purposes in Bihar. 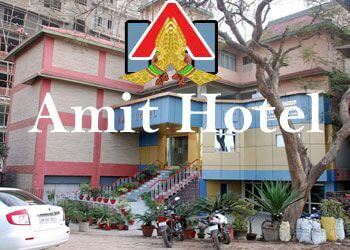 With high concern of security and facilities, we can assure that Amit hotel Patna is the best place to stay in Patna.